In a hearing on Tuesday, June 9th about SB 277, a bill proposed to abolish non-medical vaccine exemptions in California, California’s Assembly Member, Autumn Burke, a Democrat who represents District 62, publicly revealed that her 11- month-old is being vaccinated on a slower, less aggressive schedule. Many pro-vaccine parents like Burke are making a similar choice to delay or forgo some vaccines. Studies consistently show that parents with the most education and the highest income forgo or delay some vaccines, like Hepatitis B and HPV. Public confidence in vaccines is waning. According to research published in the Journal of Human Toxicology, America has the most aggressive infant childhood vaccination schedule in the world, and much poorer infant health outcomes compared to countries with fewer vaccines. Auto-immune disorders, some of which, like Guillan-Barré syndrome and thrombocytopenia, have been shown to be caused by vaccines, are rising exponentially. Neurological damage caused by vaccines is also on the rise. Autism in the United States is known to be caused by environmental triggers and has become an epidemic, affecting 1 in every 68 children in the United States. According to the paper, “ Unanswered Questions from the Vaccine Injury Compensation Program: A Review of Compensated Cases of Vaccine-Induced Brain Injury,” published in the Pace University Environmental Law Review in February 2011, at least 83 of the encephalopathy and encephalitis cases compensated by the National Vaccine Injury Compensation Program (VICP) were in people with autism. Encephalitis is the medical term for brain inflammation—which is a marker for autism. When educated parents look objectively at this information, most, like Burke, choose to follow a more evidence-based and scientific vaccine schedule. Even the most staunchly pro-vaccine advocates choose not to do the birth dose of the Hepatitis B vaccine. If parents are Hepatitis B negative, their newborns are not at risk for Hepatitis B. According to Tina Kimmel, Ph.D., a research analyst for the California Department of Public Health, who spoke at a rally in Sacramento against SB 277, in 1991 when Hepatitis B was recommended by the CDC, medical doctors and policy makers were shocked and dismayed. At least nine states have stopped mandating the Hepatitis B vaccine for entrance into daycare. Yet if SB 277 becomes law in California, parents may not choose to forgo the birth dose of the Hepatitis B vaccine. Under SB 277, any child on a “reduced” or delayed vaccine schedule will be barred from daycare, public, and private school. 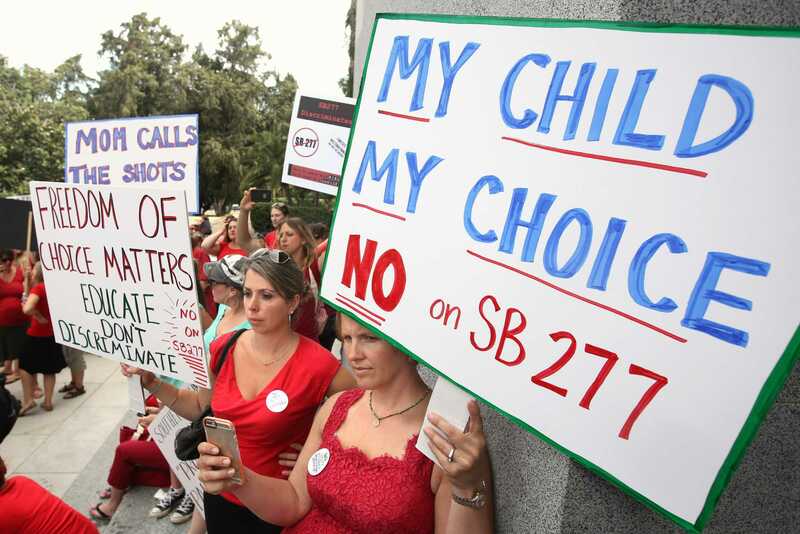 “SB 277 is an unnecessary mandate attempting to solve a non-existent problem,” says Sharla Jacobs, a mother of two and the owner of a multi-million dollar company that educates integrative healthcare practitioners. “There is no health crisis in California and absolutely no justification for this bill,” Jacobs says. “I vaccinated my children on a delayed schedule based on research that I did and conversations that I had with my doctor,” says Joni Martin, a mother of two from Santa Cruz who has a B.A. from Yale University. Martin says her children (17, 12) are both vaccinated for the measles. According to the California Department of Public Health, California’s vaccination rates are at an all-time high. Jacobs, who has an MTHFR mutation, says SB 277 will not change her mind about her family’s decision to follow a delayed vaccine schedule. “If the bill passes, we would be forced to homeschool, even though that’s not optimal for our kids,” says Jacobs, whose sons are four and seven and currently attend a private school in Santa Cruz, California. “We can’t safely follow the schedule for our kids. Scientific studies show that children with the MTHFR mutation are significantly more vulnerable to severe adverse effects from vaccine adjuvants, like aluminum and Thimerosal, which contains mercury. My children have this genetic mutation, so I’m not willing to take the risk,” Jacobs says. Looks like Assembly Member Autumn Burke may be homeschooling too. Jennifer Margulis, Ph.D., is an award-winning journalist, a Fulbright grantee, and the author/editor of five book on children’s health, including Your Baby, Your Way: Taking Charge of Your Pregnancy, Childbirth, and Parenting Decisions for a Happier, Healthier Family. A version of this article also appears on The Thinking Moms Revolution.